Photo courtesy of Can-Do Kitchen (Lucy Dilley). 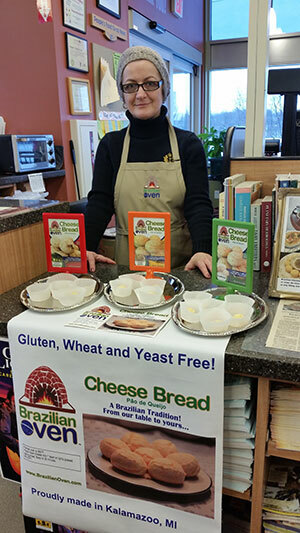 Silvana Russell of Brazilian Oven–one of the businesses in the Can-Do Kitchen–doing a demo event. What began in 2008 as a traveling “kitchen-trailer” is now a thriving food business incubator set to launch an independent enterprise. Seven years ago, Kalamazoo, Michigan-based Can-Do Kitchen moved into a custom-designed 1,400 square foot facility. The organization recently announced its separation from parent organization Fair Food Matters to become an independent 501(c)3 non-profit. The status change isn’t Can-Do Kitchen’s only new development; it also plans to move into a property next year. Program manager Lucy Dilley says the organization is hoping to use the space to expand its offerings to individuals interested in pursuing culinary careers. The incubator, in addition to licensed commercial facilities, offers business consulting, packaging and labeling resources, workshops, and connections to wholesale food distributors. Dilley says the initiative is hoping to strengthen the presence of Can-Do Kitchen in the community and clarify its mission and message. She hopes increased awareness will inspire more Kalamazoo County residents to support and pursue food entrepreneurship. It wasn’t a difficult decision for Dilley to pursue 501(c)3 status, as opposed to running a for-profit organization or another business model. Not all community kitchens have such a social mission, though. Many, like a kitchen in Virginia Beach, simply offer space without any extra business or legal training. These kind of for-profit kitchens often charge users more than their nonprofit counterparts. And a new incarnation of food incubator has recently launched in Washington D.C. StartUp Kitchen is a competition that provides entrepreneurs with the opportunity to present their ideas and food to industry veterans. One winner is chosen and then paired with a restaurant to use its facilities during its off-hours. As increasing iterations of the food incubator model appear, despite differing business models, each is bringing new offerings to their community. Most recently, Kalamazoo’s Can-Do Kitchen graduated the Free Love Bakery from its shared space, so that the brand could expand their product line. 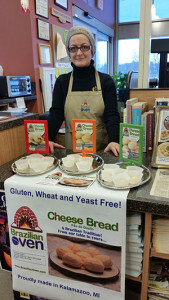 It now provides gluten- and allergen-free baked goods and breads at local stores and markets. Other products from the Can-Do Kitchen, like bean dips, cold brew coffee, and bloody mary mixes, have already been adding to the area’s offerings for a couple of years. Dilley emphasizes that the goal of the kitchen isn’t to generate profit, but to create an accessible incubator program that helps entrepreneurs overcome the many barriers that come with starting a food business.. By relying on outside funding, rather than simply income from users, the kitchen can offer subsidized rent. It costs somewhere between $14 and $25 per hour to use the facilities, depending on the type and frequency of use. That rent combines with event fees to generate about half of the organization’s operating budget. The other half is made up of donations and local grants. Dilley says the kitchen was recently able to offer scholarships ranging from $3,000 to $10,000 to nine individuals looking to launch their culinary ideas, and she’s hoping to repeat this program. Funding for the scholarships came from a federal HUD Community Development Block Grant via the City of Kalamazoo. Dilley is excited by the growth of kitchen incubators across Michigan and the United States and often meets with operators of other facilities to share lessons learned and best practices. She closely follows the work of La Cocina, a non-profit food incubator in San Francisco, California that seeks to cultivate low-income food entrepreneurs.